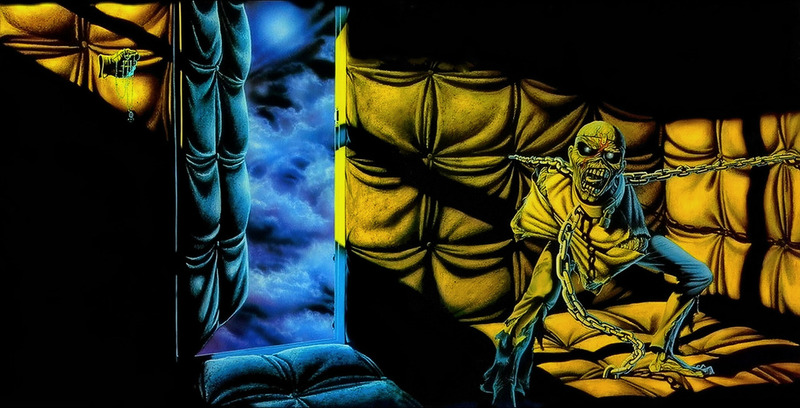 After The Number Of The Beast had given Iron Maiden their well-deserved international breakthrough in 1982, they delivered one of their very best albums just a year later: Piece Of Mind. A big drum spectacle heralds the coming of Nicko McBrain, as well as the dawn of a new era in Iron Maiden’s career and sound. After two similar-sounding albums recorded in London’s Battery Studios, the band and producer Martin Birch relocated to the sunny Bahamas’ Compass Point for the production of the first Maiden album featuring the classic line-up of Harris-Murray-Smith-Dickinson-McBrain. Click here to read about Nicko’s coming to Maiden! Life on the sunny side. The classic era Maiden line-up comes into being with the addition of ultra-reliable drummer Nicko McBrain, and promptly heads to the Bahamas for recording and drinking. And despite critics often hailing the previous record, The Number Of The Beast, as the definitive Iron Maiden album, this writer regards Piece Of Mind as the album where Maiden truly found their feet and put forth a powerful claim for timeless rock royalty. Click here for our retro review of The Number Of The Beast (1982)! Any vestiges of the band’s more simplistic roots that were present on all the previous records are now swept away, and the album takes flight with Where Eagles Dare, their most ambitious opener yet. Rhythmically and melodically, this is the sound of a band that is high on inspiration. The technical ability of the players is overwhelming, and it’s impossible to imagine this track with Stratton, Di’Anno, or even Burr. You can click on this picture for a stunning large version that leaves no doubt about the importance of the Riggs/Maiden synergy back in the 1980s. The perfect marriage of music and imagery. The 2014 black vinyl reissue recreates the original packaging nicely, while the 2012 vinyl picture disc comes in a gatefold sleeve that opens to reveal live shots of the band on the 1983 World Piece Tour. This show was probably the most visually disappointing of Maiden’s 1980s stage productions, as we’ve argued here at Maiden Revelations earlier, but the pictures make up for it with an incredible display of ludicrous trousers! Eddie has built himself wings to ascend from Hell. He torches the foolish Icarus on his way out, but the box high up in the sky is about to incarcerate him. Absolutely top-notch material follows the impressive opener: Dickinson’s proggy Revelations, his and Smith’s swaggering Flight Of Icarus with its stadium-sized chorus, and then the relentless (and thus appropriately titled) Die With Your Boots On, credited to Smith, Dickinson and Harris. Indeed, a prominent feature of the album is the fact that the band are very integrated as songwriters. With the standard of the material being so high, this seems to indicate a surplus of creative energy. The classic era Maiden line-up have food for thought, left to right: Bruce Dickinson, Adrian Smith, new drummer Nicko McBrain, Dave Murray and Steve Harris. Back on Earth, one of the most iconic incarnations of Eddie stalks a battlefield while being shadowed by Death. The only songs on the record never to be performed live are Quest For Fire and Sun And Steel. They both struggle to match the power of the previous six songs, but their quality is still impressive in the mighty strong company they keep on this record. Signing off with the powerful epic To Tame A Land, Iron Maiden deliver a monster of an album that combines determination, guts, and technical ability into a greater whole that is criminally undervalued in the squeeze between their 1982 breakthrough album and the era-defining record that was still to come. Click here for our retro review of Powerslave (1984)! Maiden’s 1983 record did not enjoy the aid of being newsworthy, as their previous work did. Nor did it benefit from technological sophistication, like some of their later 1980s work would. It had to stand on the power of its contents, and those contents still blow you away decades later. Piece Of Mind is one of their very best albums ever. A masterpiece. Nice review, but I couldn’t disagree more on that comment regarding Burr. His work on Killers and The Number Of The Beast is outstanding and I think he’s quite a match to McBrain in terms of technical prowess. That’s a fair comment, Alex. But to specify it a little more: I only made my comment with regards to Where Eagles Dare, which I personally think was unique in Maiden’s catalog to that point, and which in my opinion has a distinctly “McBrain kind of groove”. On the other hand, Burr’s work on Killers and Beast, as well as his live performances at the start of the Beast tour, are nothing short of mind-blowing. Yeah. I absolutely love the drumming on Gengis Khan too. About the stage sett on that tour 83 , for me fantastick i was on that consert 4th june Drammenshallen , awesome show the light was mutch better on the consert than it was on tv that we all have seen .. I remember the article in KERRANG magazine about Clive leeving Maiden , ooh NO! What now?, and the album was relised and i lissend to the opening of Where eagles dare i got blow’n away! . Nicko Mcbrain was the right man, that’s it ….. The opening 5 tracks to Piece of Mind make it pretty much the strongest first half of an album ever. I’m not as fond of the second half, but that doesn’t make it bad, just not as catchy to me. Just an all-around masterpiece. This I very much agree with. Side A of Piece of Mind is probably the most consistent the band have ever sounded (perhaps except Side A of Seventh Son, which also has 100% top drawer songs IMO). I also really like Sun & Steel. My only criticism of this album is the perhaps slightly sterile production compared to the bombastic sound of Killers and Number of the Beast. In some places this makes the band sound more like highly competent session musicians rather than a hungry, young band, which I guess is also a way of saying their sound was maturing. In some ways, I think of the production as quite American sounding, almost commercial in a way … it’s very clean and crisp and reminds me of some tracks by FM radio bands like Journey, although Maiden are obviously playing metal songs rather than radio-friendly rock. Interesting points! There was probably two reasons for the shift in sound. The first is obviously a new and considerably different kind of drummer. But perhaps more significantly, there was a change of studio. Both Killers and Beast were recorded at Battery in London, and they sound similar. Moving to Compass Point in Nassau was a technical step down, according to Martin Birch. He’s been open about rather wanting to record in LA or NYC if they were to work outside England, but the Bahamas it was. And the two albums they did there in their entirety, Piece and Powerslave, also sound quite similar. Somewhere In Time sounds very different from these, but in that case only the drums and bass were recorded at Compass Point.